The Archer Class submarines are newly refurbished diesel-electric submarines of the Republic of Singapore Navy (RSN). Image courtesy of MINDEF. RSS Archer was launched in June 2009. Image courtesy of MINDEF. The Republic of Singapore Navy (RSN) submarine, RSS Swordsman, berthed at Changi Naval Base. Image courtesy of MINDEF. The Archer Class is an upgrade of Västergötland Class diesel-electric submarines which were originally developed for the Swedish Navy. The modernised submarines are in service with the Republic of Singapore Navy (RSN). The two Västergötland Class submarines, HMS Hälsingland and HMS Västergötland, were commissioned into the Swedish Navy during 1987-1988. In November 2005, the Singapore Ministry of Defence (MINDEF) placed a contract with Kockums for the supply of two Archer Class (Ex-Västergötland Class) submarines under the Northern Lights programme. The contract also included crew training and logistics support. The Archer Class submarines serve the 171 Squadron of the RSN. The submarines will complement the RSN’s naval ships, helicopters and other submarines protecting the waters of Singapore. "The submarines will complement the RSN’s naval ships, helicopters and other submarines protecting the waters of Singapore." The Northern Lights programme involved an extensive refit of two submarines at Kockums. The programme was implemented in association with the Defence Science & Technology Agency (DSTA) of Singapore. The similar processes and technologies used in the upgrade of Södermanland Class were applied to Archer Class. The submarines were fitted with a new hull section integrating an air independent propulsion (AIP) system. The AIP system provides longer submerged endurance and quieter operations. The stealth characteristics were optimised during the upgrade. The subs were also provided with an advanced sonar system, torpedo system and a new climate control system for operations in Singapore waters. The first submarine in class, RSS Archer, was launched in June 2009 at Kockums Shipyard in Karlskrona. The submarine arrived at Singapore in August 2011. It was commissioned into the RSN in December 2011. The RSS Swordsman was launched in October 2010. The submarine returned to Changi Naval Base in December 2012. 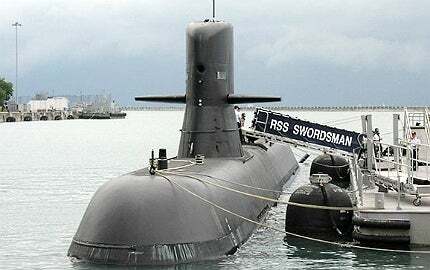 The RSS Swordsman is expected to enter service in mid 2013. The Archer Class incorporates a single-hull design. The hull integrates a fully equipped eight metre-long Stirling AIP section. The submarines also feature two pressure-tight compartments for increased safety and survivability of the crew. The stealth capabilities were refined for avoiding detection by hostile forces. The submarine has a length of 60.5m, beam of 6.1m and a height of 11.8m. The draught is 5.6m. Archer has a submerged displacement of 1,500t. It can accommodate 28 crew members. The Command, Control, Computer, Communication and Intelligence (C4I) systems of the Archer Class vessels were modernised to cope with the present and future requirements of the RSN. The submarines are fitted with command and weapon control system, active and passive sonars, radar, electronic counter measures and an integrated navigation system. The modern sonar system aboard the Archer Class submarines allows the detection of long range objects on or below the surface of the water. The Archer Class submarines are armed with six 533mm (21") and three 400mm (16") torpedo tubes. The 533mm tubes can launch heavy-weight anti-ship torpedoes, while the 400mm tubes are capable of launching lightweight anti-submarine torpedoes. The onboard torpedo system provides the ability to engage targets at long ranges. The Archer Class submarines are powered by diesel-electric and air independent propulsion system. The propulsion plant integrates two Hedemora diesel-electric engines and two Kockums v4-275R Sterling AIP units. "The first submarine in class, RSS Archer, was launched in June 2009 at Kockums Shipyard in Karlskrona." The Stirling AIP system substantially raises the sub-merged endurance of submarines. It will act as an alternative to the batteries requiring frequent recharge with the diesel generators. The AIP engines use liquid oxygen (LOX) and diesel fuel. The AIP system complements the diesel-electric engines. The LOX stored in cryogenic tanks determines the submerged endurance of the submarine. The submarine uses its diesel-electric engines in the absence of LOX supply. The AIP system offers vibration-free and silent operation, while extending the submerged endurance from days to weeks. The propulsion system provides a surfaced speed of 8kt and submerged speed of 15kt. Six Formidable Class multi-mission frigates have been built for the Singapore Navy. Changi Naval Base (CNB) is the prime naval base for the Republic of Singapore Navy (RSN). The base occupies about 1.28km² of land in Changi East.